RPF SI / Constable Answer Key 2018-19: Indian Railways – Railway Protection Force has organized the constable and sub-inspector examination from 19th December 2018 to 19th February 2019. The RPF has conducted the written tests in various examination centers across India. As per the organization reveals, almost all the applicants have competed for the RPF Constable and SI written test round. More than 10 lakhs of the aspirants seeking to get jobs in RPF competed for the written test round. 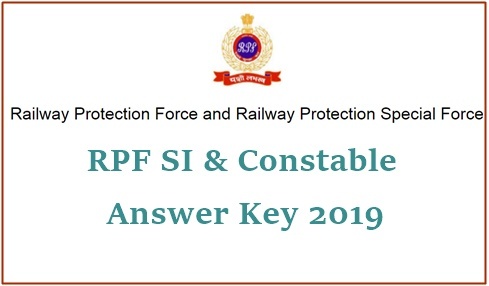 Railway Protection Force is expected to release the RPF Constable SI answer key 2018 PDF soon on its official website, rpfonlinereg.co.in. All the competitors can download RPF Constable & SI answer key 2018 PDF for the attended exam and compare with the answers given in it to estimate the score. Candidates can check with the answers given in official answer key and analyze their attempt. The Indian Railways will annually announce various job notifications to hire suitable people into various jobs. The Railway Protection Force (RPF) department of Indian Railways has released the notification for 9739 constables and sub-inspector (male and female) posts. Lakhs of hopefuls seeking to get railway jobs have applied for constable and SI posts during the application dates. The selection of suitable aspirants will be done through various rounds Computer Based Test (CBT), Physical Test (PET & PMT), and Document Verification (DV) rounds. Candidates applied for RPF Constable and SI posts must have to clear all the rounds to get the jobs in Indian Railways. Total Number of RRB Vacancies 9,739. All the competitors who have clashed for the constable and SI examination can download the answer keys after 3 to 4 days of each examination held from 19th December 2018 to 19th January 2019. The answer sheet/question paper solutions of RPF constable and SI exams will be accessible to download on the official website, rpfonlinereg.co.in. Candidates competing for the posts can visit the official website to download question paper solutions for all sets (A, B, C, D). After downloading the answer sheet, make the comparison with the attempted set to estimate the score. The competitors can understand the probable score, the rank that they are going to get in the examination. and also gets the complete clarity regarding their attempt in the test by making a comparison with the answer sheet of RPF constable and SI examination.